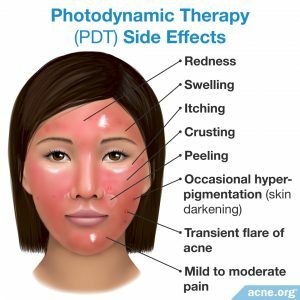 PHOTODYNAMIC THERAPY is the combination of LED (Omnilux) light and a topical medication/sensitizer called aminolevulenic acid (ALA). Before applying the ALA the patient has a microder mabrasion and an acetone facial wash to allow better medication penetration. To absorb ALA application, the patient will remain in a dark room for ½ to 2 hours. Omnilux® Blue light (wavelength 415 nM ) exposure activates the medication after induction time. Photodynamic therapy is used as off-label in an anti aging procedure and the most effective acne treatments currently available today. ALA is a chemical compound that targets specific abnormal skin cells and destroys them. This treatment originally targeted precancerous lesions of the skin and the cells of overactive sebaceous glands. This was beneficial for even the most severe acne patients. Another discovery was its predilection for aging cells of the skin. The goal being improvement in overall texture of the skin and fine lines/wrinkles, it was an off-label as an anti-aging treatment. When patients and providers follow very strict protocols PDT is quite safe. The most important instruction is that patients restrict their exposure to sunlight or other bright lights for 48 hours after the procedure.